Where you can find newspapers, magazines, digitized archival collections, and other primary sources. How to access government documents and navigate our own stacks. Sorry, the due date to order personal thesis copy has passed. Penrose Library and the Whitman College and Northwest Archives want to help you share your Undergraduate Conference research with the Whitman community and beyond! We think of the Whitman Undergraduate Conference collection in ARMINDA as conference proceedings. This means that we collect the materials you used for your presentation (slides, poster, text of your presentation), but not related research materials such as a thesis or a term paper that you drew from for your presentation. Making your work publicly available on ARMINDA gives you a showcase for future employers or graduate programs. It also can inspire prospective and current students by demonstrating the kinds of research that Whitman supports. Whitman as an institution also benefits from having more complete records of its undergraduate research. We recommend that you submit your materials in PDF/A format so that your work remains uniformly accessible across different platforms (Mac vs. PC) for a longer period of time. It is always important to check that your formatting has not changed when you convert from one file type to another, so when you save to PDF, do double-check that everything looks correct — especially figures and formulas. We have documentation on saving your files as PDF/A. If you have other supporting materials, the ARMINDA author FAQ has information on what file formats we can support. Please contact Amy Blau if you have other questions about file formats for submission to ARMINDA. Please also bear in mind that compliance with copyright law is very important when you are sharing your work publicly. Respecting the intellectual property rights of others is part of the Whitman College Copyright Policy. If you are reproducing copyrighted works (images, texts, music, etc.) in your presentation, paper, or poster, you need to either have permission from the copyright owner to share, or to determine whether you can claim fair use of that material. Please refer to our materials on determining fair use. For stock images, consider using materials with a Creative Commons license, which gives you permission to use them in various ways. Penrose librarians are happy to consult with you about any questions you may have on copyright. The final very important thing to know about submitting your WUC work to ARMINDA is that we require a non-exclusive distribution license signed by both you and your faculty sponsor (if there is more than one author/presenter, all of you should sign). This is the same license we require for honors theses — it officially grants us your permission to make your work available online, and we can’t publish your material in ARMINDA without it. You have two options for sharing your work — either with the entire world via the Internet, or with current Whitman students, faculty, and staff. Choosing worldwide open access means that you will have access to your work on the library website after you graduate, as will anyone who searches for it. There can also be good reasons to limit access of your work to the Whitman community (for example, if you or your advisor plan to publish the work in another form, or if you have privacy concerns). Just be sure that you, any coauthors, and your faculty sponsor all agree on the level of access that is appropriate. You will need to print this form, fill it out, get all relevant signatures, and turn it in to Amy Blau (in Penrose 217) or to the Library Administrative Assistant Kathleen Hutchison (in Penrose 213). To submit your work, please fill out the WUC submission form and attach your files, and bring your signed distribution license to the library office before May 1, 2019. Please contact Amy Blau with any questions about submitting your WUC project to share in ARMINDA. Check out Penrose’s newest collection – board games! Games circulate for 6 days and can be checked out at the circulation desk. Gather some friends and start playing. Ticket to ride : India + Switzerland. Players attempt to gain the most points through claiming routes and completing paths of routes in India or Switzerland. For 2-4 players. Playing time: 30-60 minutes. 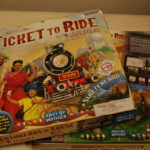 This game in an expansion and requires that you use game parts from Ticket to Ride or Ticket to Ride Europe. Ages 8 and above. Codenames Two rival spymasters know the secret identities of 25 agents. Their teammates know the agents only by their Codenames. The teams compete to see who can make contact with all of their agents first. Spymasters give one-word clues that can point to multiple words on the board. Their teammates try to guess words of the right color while avoiding those that belong to the opposing team. And everyone wants to avoid the assassin. 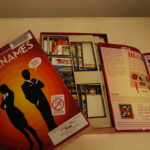 Codenames: Win or lose, it’s fun to figure out the clues. 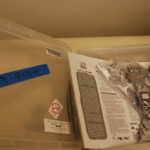 – Container.For 2-8 players, ages 14 and up. Playing time: 15 min. 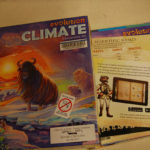 Climate : Evolution conversion kit This conversion kit is designed for players who already own the Evolution base game. It contains everything needed to transform your base game into Evolution: Climate. In Evolution, your species must adapt to avoid starvation and fierce predators. Evolution: Climate creates an additional challenge: the ever-changing climate. Give your species Heavy Fur to protect them against the bitter Ice Age, or give them Nocturnal to avoid the heat of the cruel desert sun. With amazing new traits and extraordinary new challenges, this conversion kit makes Evolution more diverse, more strategic, and more rewarding. 2-6 players. Duration of game: 60 minutes. Age 12 & above. 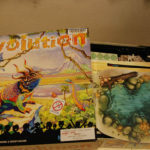 Evolution : the dynamic game of survival In Evolution, you’re in the midst of a dynamic ecosystem of limited resources and hungry predators. What traits will your species need to eat, multiply and thrive? The answer changes with every game. 4000 different species to create. Title from back of box. 2-6 players. Duration of game: 60 minutes. Age 12 & above. Land Rush Land Rush is a game that simulates the complex reality of access to, and management of, natural resources in developing countries. For 3-5 players. Playing time: 75 minutes ; debriefing time: 60 minutes. 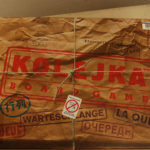 Kolejka = Queue “Here’s your shopping list. Grab a shopping bag and go. Easy job, you think? Not in communist Poland it isn’t. The shops are empty, deliveries are rare and there’s never enough to go around. At the door there’s already a long queue waiting for the goods to arrive; some say there’ll be a delivery today but you never know. In a centrally planned economy shoppers have to think strategically, so make sure your family members are standing in the right queues, listen up for rumors, watch out for speculators and, above all, hold on to your place in the queue because only strong elbows and knowing the ins and outs of the 1980s communist economy will allow you to secure the basic commodities on you list.” For 2-5 players. Ages 12 and up. 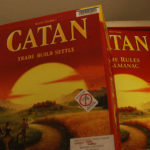 Catan: trade, build, settle Your adventurous settlers seek to tame the remote but rich isle of Catan. Start by revealing Catan’s many harborsand regions: pastures, fields, mountains, hills, forests, and desert. The random mix creates a different board virtually every game. No two games are the same! Embark on a quest to settle the isle of Catan! Guide your settlers to victory by clever trading and cunning development. Use resource combinations — grain, wool, ore, brick, and lumber — to buy handy development cards and build roads, settlements, and cities. Acquire your resources through trades, cards, or lucky dice (even outside your turn). But beware! Someone might cut off your road or buy a monopoly. And you never know when the wily robber might steal some of your precious gains! For 3 to 4 players, ages 10 and up. Playing time: 60-120 minutes. The catalog, which is accessible via Sherlock, will help you find materials in Penrose, including links to eBooks and eJournals. Search Summit via the dropdown menu in Sherlock to find resources at other libraries and have them sent here. Find out more about using Summit and Interlibrary Loan. Find materials your instructor has put on reserve. You can look up course materials by course name or number or by your instructor’s name. Find scholarly articles by searching our databases and online journals. Do you know the name of the journal or newspaper you need? You can find it by searching our catalog in Sherlock, or our Journal Finder. The Whitman College and Northwest Archives holds rare books, historical manuscripts related to the Walla Walla region, and records related to the college. Librarians can help you decide on paper topics, narrow your topic to a reasonable size, and locate the right materials for your research. They can help you with many aspects of your research, such as finding information resources in print and online, planning a research strategy, and designing catalog and database searches. You’re welcome to drop in or to make an appointment for a research consultation using the following form.